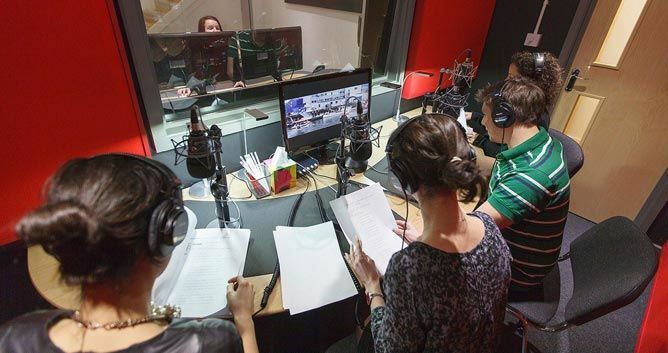 In dubbing in movies and TV series, to animate crowded scenes, to create the human noise, a few people come together to add the meaningless voices. This is called rhubarb. Some of the sounds, such as screaming and sometimes whispering, are used in some crowded scenes with the intention of effect. The expression “Rabarba” is correct. “Labarba” is incorrect in Turkish. Rabarba is not used worldwide. It is a jargon that derived from old Turkish movie sector. People who make these noises in movies and TV series are called “rababaci”. In Yeşilçam cinema periods, during the filming of the crowded scenes of cocktail parties, birthdays, engagements, etc., the actors who usually play the standing guests are asked to say something off-script as if they are chatting. At those times, it was possible that they could not find anything to talk about in the studio, or extras can extend the process, so they are asked to repeat the word “rabarba”. These words, which are not voiced by the people who make up the crowd, can be heard as a human voice and humming, which are not remotely understood, and they appear to be chatting among themselves. While this was the case in Yeşilçam cinema, rabarba was constantly used during the Turkish dubbing of imported films. However, it has been seen that the voices of dialogues have been made in some imported films which were made hastily and sloppy in Turkish, but that crowded human voices were left untranslated. Today, in the Turkish cinema, rabarba is not used much, but the development of sound technology has started to produce alternative solutions to rabarba during dubbing. Rabarba can be performed by anyone. But it must be performed in a harmony. Rabarba is a subject related to dubbing. For some commercial voice-overs rabarba is not ideal. We find different solutions to that. To perform rabarba many people are needed in the studio at the same time to create a crowded sound. And it’s not preferred and convenient in today’s industry.